GBP/JPY was trading higher and jumped more than 150 pips after UK PM Theresa May won no confidence vote in narrow margin 325 votes to 306 votes. The voting on UK PM May Brexit plan B and amendments to the motion will take place on Jan 29th. According to YouGov poll shows that support for UK to remain in the EU has increased to 56% versus 44% leave. GBP was trading higher against all majors with Cable holding well above 1.2900 level. 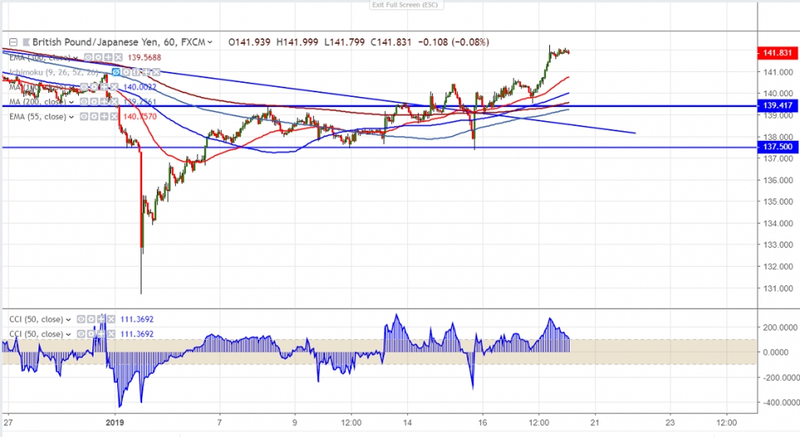 Any break above 1.3000 level confirms bullish continuation.GBPJPY hits high of 142.21 and is currently trading around 141.89.Markets eye UK retail sales for further direction. On the higher side near term resistance is around 142.05 (55- day EMA) and any close above targets 142.65/143/143.95. The near term support is around 140.70 and any break below will drag the pair to next level till 140/139.50.The pair should break below 139.50 for further weakness. It is good to buy on dips around 141.10-20 with SL around 140 for the TP of 143.90.